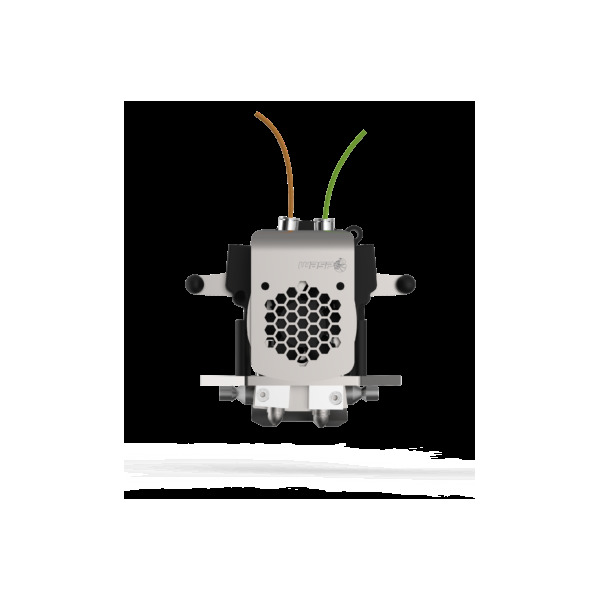 The new DeltaWasp ZEN extruder adds dual nozzle printing capabilities to the DeltaWasp Turbo 2 and DeltaWasp 4070 Industrial 3D printers. It is compatible with wasps new cartridge system, with a low temperature and high temperature core available. The low temperature version can heat up to 270°C with a teflon tube allowing it to print flexible filament. The high temperature core is an all metal design that heats up to 350°C. The ZEN features cleaning flaps to prevent oozing and a motor free nozzle raising system to prevent contamination. Anti-oozing: Built in flaps prevent oozing while printing with the other nozzle. Motor free switching: Nozzles are raised and lowered independently without the use of a motor, keeping the weight to a minimum. Versatile: Print with two colours, materials or nozzle sizes at the same time thanks to the modular system and dual nozzle design.